The first Heider C 12-20’s were sold as Carroll IA Heiders in late 1913. After 1913, they were sold through the Rock Island Plow Company. Rated a 3-plow 12-20. An updated version of the Heider C with a Waukesha P engine rated at 15 -27, but otherwise identical to the C.
1 and 2 row cultivator tractors using a LeRoi engine that could also be used as mobile power units. outstripped their Carroll IA factory’s capacity. In 1913 the company went looking for a partner, which they found in the Rock Island Plow Company. In 1914 the Rock Island Plow company took delivery of the last of the Heider B’s under their new contract for sale and by 1916 the success had been so great the Rock Island Plow company purchased the Heider Tractor line. The Heider C that had been introduced in 1913 was a more refined design then the A and B’s and would prove popular for many years. One of its greatest strengths however, was also its greatest weakness, and many farmers complained of the paper disk friction drive slipping. Henry Heider remained with Rock Island on a contract basis until 1922, but the design was given few changes beyond a smaller 9-16 version D. In 1924 amidst slipping sales the C was upgraded to a larger engine and rebranded the Heider 15-27. Finally in 1927; faced with an ever decreasing market share, obsolete designs and waning customer satisfaction; the company dropped the Heider line in favor of the new Rock Island 18-35 F and 15-25 G. The last use of the Heider name was with the last sales of the Heider D in 1929. There is a thread on replacing the friction disk on Smokstak HERE. In addition, I have transcribed a report and discussion from Charles Trask of Rockwood MFG Co discussing friction disk technology. 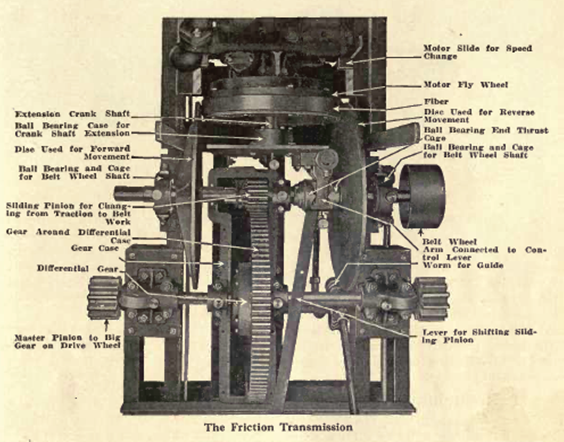 Rockwood appears to have been the supplier of the friction transmission components. Some advertising and 3rd party catalogs indicate a winch tractor based on the E platform. RIPC’s French import company produced its own version of the Heider C and would later produce a diesel tractor on its own.